After talking about Minute Repeaters and Perpetual Calendars which I hope you all read and enjoyed, the time has come to present you Chronograph Watch Trends For Men 2014. So if you were looking for a great chronograph watch, stop doing it, because I’m sure you’ll find the right one in our top 5 Chronograph Watch Trends For Men I have prepared for you today. So what exactly is a chronograph? Well it’s a a specific type of watch that has an independent sweep second hand and is used as a display watch combined with a stopwatch. The chronograph was invented back in 1816 by Louis Moinet and it was used in tracking astronomical objects. So let’s see the Top 5 Chronograph Watch Trends For Men 2014! 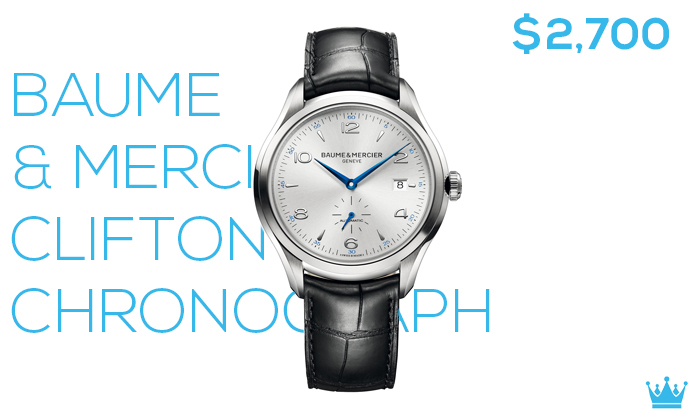 The Baume & Mercier Clifton is a steel and round 41mm watch for men which comes with an automatic movement featuring small seconds and date functions. The Clifton model was inspired by another model dating back to 1950 and it’s a traditional timepiece with a sun satin finished silver coloured dial featuring Arabic numerals. The watch features a Swiss made self winding movement, a sapphire crystal case back and is aprox. 50m water resistant. The first Daytona was introduced back in 1963, and is one of the watches that required a waiting list at authorized dealers. The number four on our Chronograph Watch Trends For Men list for this year was named in honour of the racing drivers who competed on the famous race-track in Florida, USA, and who appreciated its easily readable dial. 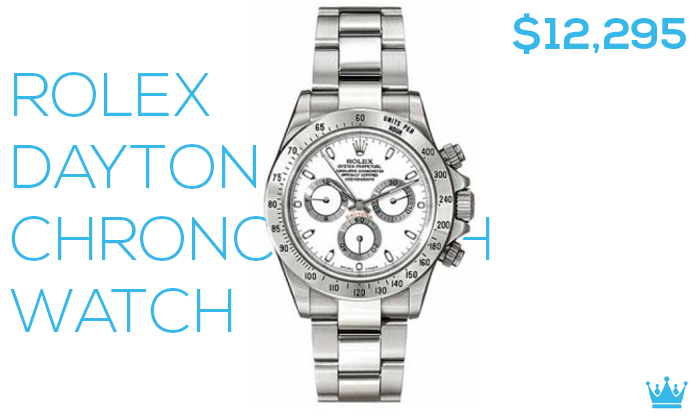 The Daytona features a 40mm stainless steel case, a white dial with a fixed engraved bezel and screw down crown. And the good part is that now you don’t have to sit on a waiting list until you can acquire one. 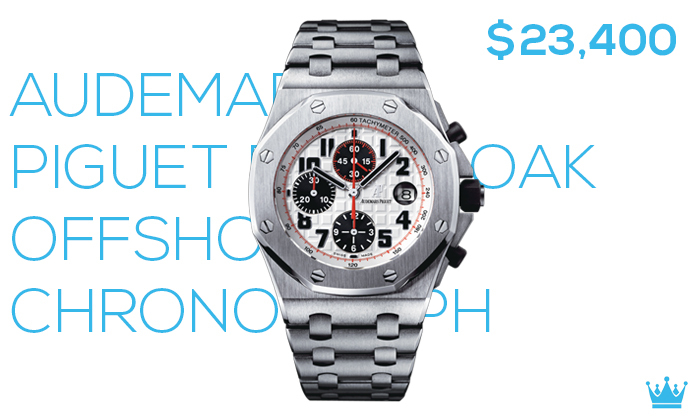 The Royal Oak dates back to 1972 and was designed by the legendary Gerald Genta. The Offshore collection was introduced later on in 1993 . The Audemars Piguet watch features a 42mm wide case with sapphire crystal, black rubber clad screw-locked crown and push-pieces and is water-resistant to 100m. You can choose various types of bracelets for it, from stainless steel or titanium, to hand-stitched crocodile strap with stainless steel or titanium AP folding clasp. The Meisterstuck Heritage collection of Montblanc was unveiled at the SIHH 2014 and includes this amazing Pulsograph timepiece. The watch runs on a hand-wound column-wheel chronograph movement that was manufactured in the Minerva Villeret workshops. The number two on the Chronograph Watch Trends For Men 2014 list will be made in a limited edition of 90 pieces and it will be available for sale this fall. 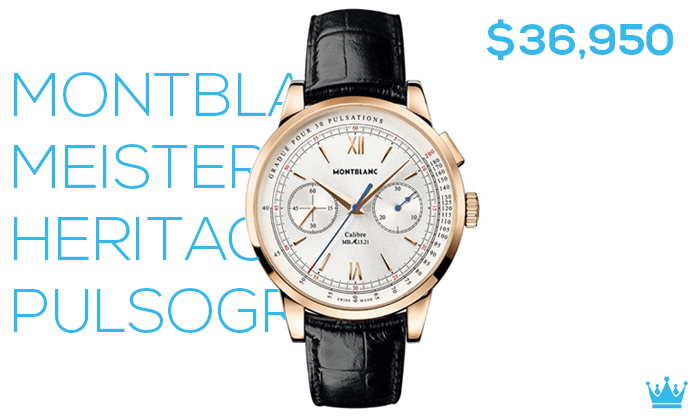 With a round 41mm wide gold case, the newcomer from Montblanc looks amazing, so prepare your wallets! So here we are at the number one on the list of top 5 Chronograph Watch Trends For Men 2014, ending it with a superb timepiece from Penerai. This watch comes dressed in 3 types of gold, but today we’re going to talk about the Oro Blanco, in translation: white gold. 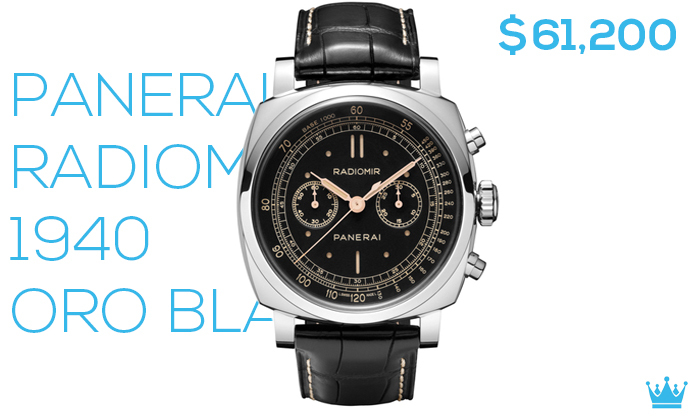 The Radiomir 1940 Oro Blanco features a polished white gold case, deep black dial, and sand-colored dial markers. Being the number one on our Chronograph Watch Trends For Men 2014, it’s no surprise that the Oro Blanco is limited to a number of 100 units. So what do you think about the watches? Has any of them ended up on your “must buy” list? We hope you enjoyed our article on Chronograph Watch Trends For Men 2014. Let us know which one is your favourite in the comments section bellow, and don’t forget to share this with your friends.